There are similarities and differences when it comes to mold and mildew. Firstly, both are members of the fungus family. At first glance, it would be easy to mistake one for the other. They both grow in damp conditions. However, looking a little deeper at the two, you will discover that they differ in appearance such as; color, form, and size. Of course, another big difference is how they are eliminated. Your NJ mold testing service will be able to identify which form of fungus you may have and direct you toward the right treatment. Simply put, mold and mildew are different. Mildew grows on the surface, attracted to wet areas. It also grows flat and is typically black. Inside of a home, mildew is typically found on countertops, paper, walls, and any surface that is porous or susceptible to liquid. Mildew can also be found in a powdery form on plant surfaces. It can even be found as spots on food like grapes or apples. Mildew is very easy to wipe clean with typical household cleaners. Your Bergen County mold tester will have no problem diagnosing whether the culprit is mold or actually mildew. Mold often takes on more of a 3D texture and can have interesting textures. Typically, mold has a fuzzy appearance with colors ranging from green to gray to black. Mold is also more complicated than mildew due to the fact that it can be hidden. Mold can grow and thrive within walls, under carpets, and in the air. As a result, mold is tougher to spot, let alone eradicate. No homeowner likes to see the presence of either mold or mildew. However, the ease of getting rid of mildew makes it less of a threat. Mold, on the other hand, can become a threat to both the health of a home and the inhabitants of a home. When mold is hidden and continuously producing spores, it becomes not only a health risk but also a risk of spreading to other areas. Unless the mold has a scent or is visible, you may not know it exists. That is why it is important to test your home for mold! 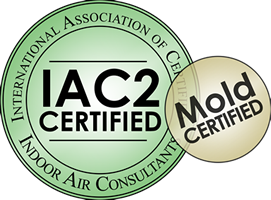 Certified Mold Testing LLC can help you with all of your NJ mold testing needs. We welcome the opportunity to get you up to speed on the process. Let our knowledge and experience help you discover whether mold exists in your home. Certified Mold Testing Service NJ LLC is the premier mold testing service in New Jersey and New York.